Acne is not a just a teenage issue. Many adults go through this unpleasant phase too. 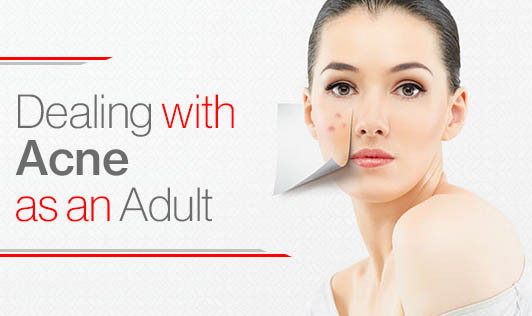 Studies report that many adults who have had nearly 100% clear skin (with one or two zits here and there) throughout their teenage might experience a drastic change later on in their lives. Hormones: Hormonal changes around the mid-twenties may play a significant role in breakouts especially in women. Androgen, a hormone responsible for the stimulation of oil glands and hair follicles in the skin, can be overproduced and can lead to flare-ups. Stress: Stress plays a major role in aggravating acne. The hormone, androgen, is produced excessively during times of stress, causing breakouts. Medications: Some medications like oral contraceptive pills (OCP), lithium, anti-seizure drugs, and corticosteroids may also cause acne. Consult your doctor about the medication you’re on and find out if there’s a more skin-friendly alternative. Diet: A diet rich in processed foods and sugar usually causes acne. Beauty Products: Make sure that the products you use on your face are of good quality and use them by maintaining proper hygiene. Hair styling gels and similar products may clog pores and cause acne when they come in contact with your skin. Environmental Factors: Weather, humidity, and pollution contribute largely to the outbreak of acne. Remember that devices which come in contact with your skin like cell phones are equally to be blamed for the flare-ups. This happens when your screen is not clean and bacteria gather on it. Wash your face no more than twice a day. Believe it or not, washing your face often may actually be making the oily skin problem worse. Your skin needs oils, which is why it produces them, and if your skin thinks it’s drying out or doesn’t have enough of those oils to protect it, it produces more oil. Use cool or warm water and a gentle cleanser which doesn’t strip away the moisture from your skin. Use a soft towel to wipe your face and pat dry and do not rub too hard. Follow it up with a moisturizer meant for oily skin. If nothing works, please consult a dermatologist who can assist you better. What works for someone else may probably not work for you.